schools in each State--will soon be served breakfast at school. gardeners in a year or so. Look for the Mohawk and Cayuga. grow as far north as Ithaca, N.Y.
researchers at the U.S. Department of Agriculture. basement, melting snows and spring rains are bound to mean a basement full of water. Documents, Government Printing Office, Washington, D.C. 20402.
tion in a form that should appeal to a wide variety of clubs and other organizations. D.C. 20250. Ask for PA-772. temperature of the room change. spring--you can rush the season a bit by force-blooming shrubs inside your home. replace water frequently. And expect blossoms in 2 or 3 weeks. in a solution, pressed and creased while damp, then cured. 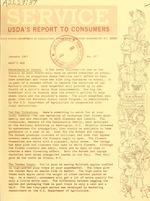 insecticide treatments were applied to keep fruit flies out of the United States. This is the third year sterilized flies have been used. procedure as a quality control. strength after a scant 12 months. oats, alfalfa, petunias and beans. These will be used as test plants. Roll Out the Egg. A roll of hard-boiled egg has been developed by Clemson University. have on hand, ideal for use in garnishing salads and casseroles. lettuce rose 3 cents a head; grapes rose 2 cents a pound; cucumbers, a cent and a half. In the months ahead expect to see more pork offered as "specials" at your supermarket. largest on record, so look for a price drop in both fresh fruit and frozen concentrate. winter and probably they will be a little lower in price. fact that coffee consumption is going down and tea consumption is trending upward. Coffee drinkers averaged 15 pounds per person in 1965 (down 3 pounds from 1947-49). pressure adjusts the temperature; a change in pumping rate controls the heating periods. For maple sirup lovers it means just one thing--a more flavorful product. equipment and livestock, and to establish a long list of needed trades and services. required, the interest rate is 4 percent. mation, U.S. Department of Agriculture, Washington, D. C., 20250.